The 28th of August marks the 50th anniversary of the March on Washington for Jobs and Freedom, one of the great turning points of the black Civil Rights Movement. The anniversary got me thinking, what do Asian Americans owe to the black Civil Rights Movement? I know that probably seems like an odd question. 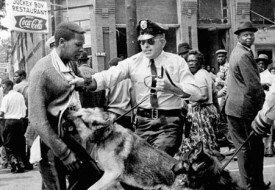 I mean, many of us, not just people of color but LGBT people, people with disabilities, women, religious minorities, and, to boot, people of all creeds and colors who wish to live in a country where there may one day be true, broad based, inclusive democracy owe an obvious debt to the the Civil Rights Movement. That movement cast a bright light on a glaring contradiction that, nonetheless, managed to escape the attention of millions Americans; the contradiction between our democratic ideals, and the reality of the existence of anti-democratic laws and deeply ingrained racist customs that excluded the vast majority of black people from full political and economic participation in our society. The black-led Civil Rights Movement made that contradiction visible and inspired many of us in subsequent generations to take action to reconcile the many other contradictions of American democracy. But, the Asian American model minority myth, that unfounded but nonetheless popular lie that claims Asians in America were able to rise to success without the help of government programs and political reforms, makes the answer to my question of what Asian Americans owe to this legacy unclear to many. Did Asians just lift themselves up and out of poverty and exclusion by our boot straps, or do we owe a debt to the black Civil Rights struggle? Most Asian Americans of my generation, the generation born in the U.S. in the 1960s, know the answer to that question is an emphatic yes. We did not just pull ourselves up by our bootstraps. Instead, we owe a great debt to the Civil Rights Movement. I say the upcoming anniversary of the March is as good a time as any to start talking about it, regardless of our generation, and loud enough for the public to hear. Ending bans on interracial marriage: 36% of Asian women and 28% of Asians overall entered into interracial marriages in the U.S. in 2010, making us the most likely to marry outside our race among all groups in that year. These marriages might never have been possible if not for the Civil Rights Movement. Specifically, Loving v. Virginia, a case brought in 1967 by a white man and a black woman, ended the ban on all interracial marriages in the U.S. The Lovings were supported in their case by many civil rights groups, including the NAACP Legal Defense and Education Fund and the Japanese American Citizens League. Voting Rights Protection: Chinese Americans were made voting citizens in 1943, largely as a result of international pressure on the U.S. from foreign allies during WWII. Asian Indians followed in 1946, and other Asian Americans in 1952, all before the passage of the 1965 Voting Rights Act. However, the 1965 Voting Rights Act provides critically important protections to Asian American voters. For instance, without Section 2 which prohibits discrimination against people belonging to language minority groups, the voting rights of many Asian Americans would mean little or nothing. The Immigration and Nationality Act: The Act ended racist immigration bans that once excluded Latin Americans, Asians, and Africans from immigrating to the U.S. At the height of the Civil Rights Movement, the racist bans were viewed as an embarrassing contradiction to the Johnson administration’s civil rights agenda and thus the Act was signed into law by President Johnson at the foot of the Statue of Liberty in 1965. The immigration histories of the majority of Asian Americans living in the U.S. begin after that date. We would not number 18 million, and be rising faster than any other racial group as a percentage of the population if not for that Act. There is much more we owe. As the anniversary of the March on Washington approaches, we would do well to try to take ownership of that debt publicly as a first step toward repaying it. Great Post. As an asian man married to a caucasian woman and with 2 children I found it shocking that its only been since 1967 that interracial marriage was legal throughout the US. Please keep up the informative articles, I think its important that we remember how far we have come… and how far we still have to go. Thanks, Yosh. I do think that interracial marriage bans being lifted are a very important achievement. After all, they were instituted in order to maintain racial separation and purity. There are few ideas more conservative when it comes to race than that. Important post, but just a clarification. The Magnuson Act that repealed the Chinese Exclusion Act in 1943 allowed Chinese immigrants to become naturalized citizens and gain the right to vote once they became citizens; they didn’t become citizens automatically. American born Chinese and other Asians already had the right to vote by their birthright citizenship (thanks to Wong Kim Ark, who won his case in the Supreme Court in 1898) though of course I’m sure they faced obstacles to vote. We do owe a lot to the Civil Rights Movement including Asian Americans like Yuri Kochiyama and Grace Lee Boggs who worked side by side with a lot of African American leaders. Thanks, Grant. Always love to learn from readers and your comment is an important clarification. Really appreciate it. I have to say that I do not agree with this post nor do I like the way it is written. Asian Americans may have things that they owe to the African American Civil Rights movement, but African Americans also owe a lot to the Asian American Civil Rights Movement. Asian Americans accomplished a lot by themselves, while supporting a number of different Asian ethnicities, African Americans, and Latinos. I also find the first number point quite troubling: are you implying that one needs to be married to a Caucasian or non- Asian to move up in society? Whether you are or not, this is what it sounds like, and is going in a completely opposite direction than what we should be going in. Your post is ludicrous.The Asian Civil rights movement only benefited Asians…most definitely not black people.The black civil rights movement benefited everyone.Asians with a few exceptions kept to themselves when all hell was breaking loose in the US during the civil rights movement.He is saying that if black people didn’t fight for the right to marry non black people..Asians wouldn’t so quick to marry white people(especially the women).Being white is seen as positive in many Asian cultures.That’s why they get eye and nose jobs,pay white foreign English teachers more than Asian foreign English teachers from Anglo countries,and marry white guys so often.What have Asians done for black Americans? Even in a site about racial equality and civil rights, there’s still a relentlessly racist bigot peeking their head out and spewing its message of hate. Get outta here and go join your fellow WBC or Klan or whatever members you belong to. Um, I almost didn’t respond to this because the obvious anti-Asian racism expressed here seems to me to be beyond contempt. But, I do want to make the point that what I said here is that Asian’s benefited from the Black civil rights movement and should recognize this historical reality and consider ourselves allies of Black civil rights today. That’s why the post is called Three Things Asian Americans Owe to the Civil Rights Movement. It was meant to remind Asian Americans that we owe something to the Black-led civil rights movement. But, I also want to make the point that Asians aren’t trying to be white or expressing a preference for whiteness when they hire white English language teachers or have surgery to make their eyes look more “western,” anymore than Beyonce is trying to be white by dying her hair blonde, or Oprah Winfrey is expressing a preference for white people over other people by ironing her hair straight. What they are trying to do is make themselves viable commercial entities in a white dominated commercial arena. I think this is important to note because it speaks to the way white supremacy shapes our expectations and aspirations. Vertically integrating into white dominated markets requires us to make concessions we shouldn’t have to make. I googled the asian response to equality and found this article. Im a qtr Okinawan. And being so, I identify myself more as asian than the amalgamation of European bloods in me. But I was raised in Oklahoma in a relatively poor neighborhood dominated by NDNs listening to late 80s and early 90s conscious and gangsta rap. I grew up around pow wows, legends, and drive bys. I got best hair as a freshman in high school with an afro and joined the minority club as the only non black member. To say the least, im a minority amongst minorities. One of a kind. Proud of who I am. My grandparents full blooded white and Japanese were married in the mid 50s. But I know Hawaii had different laws than the continental states. Can you elaborate more on that, and maybe my whole experience? 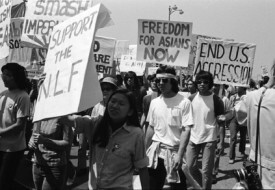 Asian Americans DO NOT owe the Civil Rights Movement. The Civil Rights Movement owes Asian Americans, specifically Chinese Americans. Before “Brown v. Board of Education”, all the major civil rights victories were won by Chinese Americans. And the most effective civil right organizations wasn’t the NAACP but various Chinatown Benevolent Associations and Chinese Chamber of Commerce. Here are some of the landmark cases. 1. “Yick Wo v. Hopkins”, 118 U.S. 356 (1886). The Supreme Court found that even though the San Francisco’s Laundry statute was facially neutral, it’s application was prejudicial to Chinese American laundries. That this violated the Equal Protection Clause of the Fourteenth Admendment. “Yick Wo” was the basis of decision in “Brown v. Board”, and subsequent Supreme Court opinions which struck down “Jim Crow” laws. 2. “United States v. Wong Kim Ark”, 169 U.S. 649 (1898). The Supreme Court held that a Chinese American whose parent were legal residents of the United States was automatically a citizen of the United State. This opinion established the legal interpretation of the Citizenship Clause of the Fourteenth Amendment. 3. “re Lee Sing”, 43 F. 359 (C.C.D. Cal. 1890), Asian Americans successfully petitioned the Court to declare San Francisco’s “Bingham Ordinance,” mandating residential segregation, unconstitutional. 4. “Ho Ah Kow v. Nunan”, 12 F. Cas. 252 (C.C.D. Cal. 1879), San Francisco’s infamous “Queue Ordinance” was invalidated on equal protection grounds. 5. “re Ah Chong”, 2 F. 733 (C.C.D. Cal. 1880), the Court found that a law forbidding Chinese-Americans from fishing in California waters was unconstitutional. Chinese Americans have a proud legacy of defending their rights. And their courage and determination has benefited all Americans.